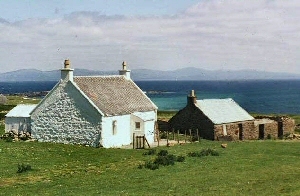 Hamish Dawson-Bowman also bought the Island of Erraid in the early 1950s. This tiny island lies off the tip of the west coast of Mull and overlooks Iona. Subsequently, John Hart left C.A.I to pursue his own individual career as a silversmith. 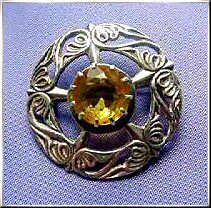 Silver brooch by John Hart, early 1950s, with attractive Iona-style vine-scroll decoration and a central Cairngorm faceted stone. Reverse marks JH and Iona, Sterling Scotland. 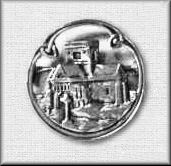 Unusual sterling silver brooch, diameter approx 1.25", depicting Iona Abbey and St Martin's cross. 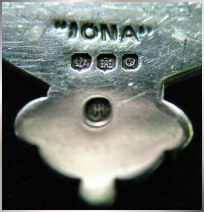 Hallmarked for Edinburgh 1962 and stamped IONA, also combined JH initials for John Hart. 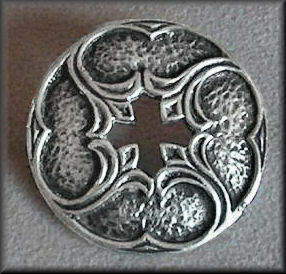 Attractive small silver Iona cross by John Hart. The front has panels of knotwork. 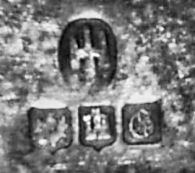 The reverse is marked IONA and SILVER, as well as the combined JH symbol of John Hart. Length appox 1.75". 1950s period. John Hart Iona silver plaid brooch. Knotwork and beasts design. 1950s. Marked IONA - SILVER and JH combined letters. Silver knotwork brooch by John Hart, hallmarked Edinburgh 1962 with his initials and IONA on reverse. 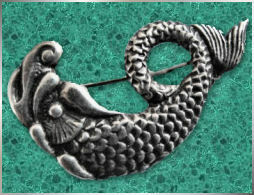 Attractive silver 'sea monster' brooch by John Hart, originally from an Alexander Ritchie design. This one has the JH monogram on the reverse, as well as 'IONA', and an Edinburgh hallmark for 1963. 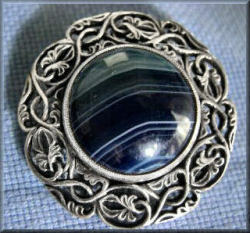 Attractive silver brooch by John Hart, with foliate decoration surrounding a dark blue banded agate. Hallmarked Edinburgh 1961 and maker's JH stamp. 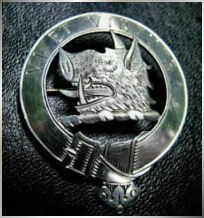 Scarce hand-pierced and hand-engraved clan brooch by John Hart. Inscription reads 'Vi Et Virtute' (By Force and Valour). Finely-engraved boar's head (possibly Clan Sloan?). 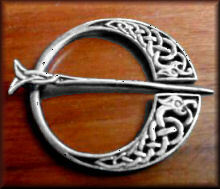 This is the only Iona stamped clan brooch I have yet come across. Nice clear 'JH' monogram, with IONA stamp, and full Edinburgh hallmark. 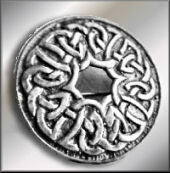 Beautifully stark John Hart silver brooch, with the design taken from the ornamentation of Iona Abbey tower windows. Reverse marks are JH, Iona, and hallmark for Glasgow 1960.